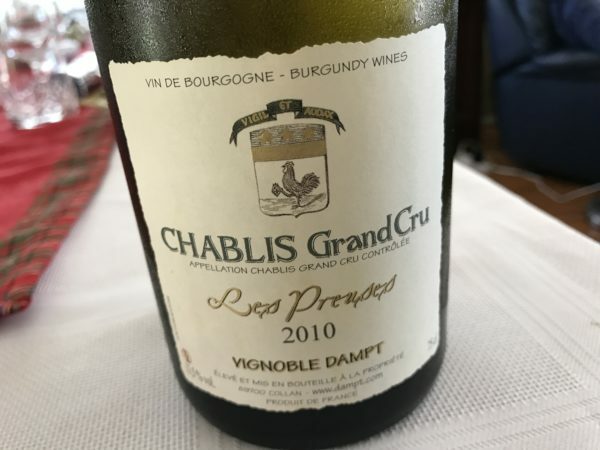 I opened this on Vignoble Dampt Les Preuses Chablis Grand Cru 2010 on Christmas Day with high hopes. Preuses is one of my favourite Grand Cru, and all the ’10 Dampt Freres wines were drinkable at the least when tasted about 3 years back. In retrospect, that I paid just €25 direct from the cellar is pure madness. The sort of madness that makes you want to travel to Chablis just to drink all the wine. Right now. This is in a pretty good place too. I’m not convinced this was the best bottle – the colour was a little more golden than expected – but the Chablis character was strong in this one. Think lanolin, wood wall and the odd hint of mothball with lots of double cream richness. The palate is more diffuse than you’d really want, but it’s expansive, tangy and long. Best drinking: 2017-2020. 17.5/20, 91/100. 13.5%. Would I buy it? At the direct price, absolutely. For the $110 local price? Nup.